This is one of those books where you have to hang onto your seat and follow the ride wherever it takes you, and oh my goodness what a ride it is! Susanna is probably more on her guard than the average counsellor because she has a deep and dark secret. The type of secret that is worth saying goodbye to her old life, and starting somewhere else with a brand new identity, all evidence of the past covered over. So now she leads a narrow life which consists of her, and her daughter Emily who is now fourteen years old. Susanna loves Emily and sees her role in life, above all others to keep her safe. So much of this novel is the conversation between counsellor and counselled which gives the book an incredibly claustrophobic feel. The dialogue between the two is captivating and made all the more so because we know Susanna has something she is trying to hide, but what it is and why she needs to keep it quiet is eked out in a way that had this reader conjuring up different scenarios, most widely off-beam. On one level it is fascinating to watch the game that is being played out in front of our eyes. The weighing up of options on the one hand with the absolute determination to keep the upper hand on the other gives us an immediate view of how liars operate which felt quite unlike anything else in the genre. Yes we often come across manipulative characters and we even see them in full flow but to have an entire book that is based upon a sustained conversation is very unusual indeed. Although some of the themes have quite naturally been explored by other writers, this is an author so sure of his penmanship that the reader is left to draw their own conclusions to what these might be and he doesn’t go down the well-worn path of what is often trodden by writers in this genre; prepare to be surprised. The Liar’s Room is clever, very clever. Yes, once I got quite a way into the book, I was able to discern some of what had either happened, was happening or would happen, but I was a long way off the entirety of the answers to all the myriad of questions. This is both spell-binding and compelling and terrifically well written and has firmly cemented Simon Lelic as an outstanding writer. I was already a fan having read and loved The Child Who and more recently The House, and The Liar’s Room has just added to my admiration of an author who can create some basically unlikeable characters but with enough credibility to keeping it real which meant that I couldn’t feel a bit of sympathy for them on at least on some level. This would undoubtedly be a terrific book club read which I’m sure would provoke some lively discussion because of the strong reactions it is bound create. 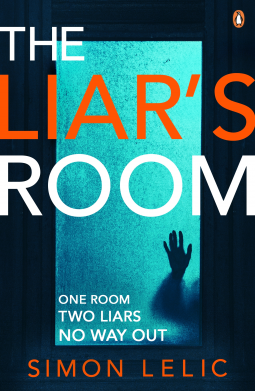 I’d like to say a huge thank you to the publishers Penguin who allowed me to read a copy of The Liar’s Room ahead of publication in paperback on 9 August 2018. Thank you also to Simon Lelic for keeping me up way past my bedtime in order to find out what happened, and then later still as I pondered what I had just read. Psychological thrillers aren’t something I naturally gravitate to but your fantastic review has intrigued me so much that I think I may have to make an exception for this one. I have nothing but admiration for an author who can manipulate the reader so that although the reader KNOWS they’re being manipulated they still want to read on…in fact, the being manipulated becomes part of the fun. If you know what I mean. Off to check online if I can get a copy of this from my local library. Just the season for this kind of book, when staying up late doesn’t cause too much suffering the next day, because it is summer after all. Incredible how a writer can take a reader on such a journey. I like on the edge books. Hopefully at some time I’ll be able to get this. This does sound like a fascinating psychological thriller, Cleo. And it’s interesting that Lelic chose to focus on that counseling relationship. It’s an intense relationship, even intimate, in its way, isn’t it? This really does sound like an absorbing read! Oh, I’m glad to notice that someone else mentioned that The House is called The New Neighbors here…as that was my only book by Lelic so far…and I might have ordered something I already read! The Liar’s Room doesn’t come here for a really long time (Jan. 2019), but knowing how time flies, I’ll be bookmarking it. I do like the idea of sitting in a therapist’s room with squirmy thoughts and feelings coming out…not fun, but definitely enjoyable. I must say I find the idea of the whole thing being more or less done through conversations intriguing – I don’t think I’ve ever come across that before. You make me want to read this one right away, Cleo. Add it to my pile! I love the cover and the title, too! I loved ‘The House’ and think Simon Lelic is a very talented writer. Thanks to your review, I now can’t wait to read ‘The Liar’s Room’, which sounds every bit as good. Might be a tad out of my comfort zone but I might just read it for this reason. I do try to shake up my reading now and then. Excellent review. Oh I like the sounds of this one! Does it cover just one counselling session over a day, or does it take place over a few sessions?